Running with my holo gradient theme from earlier this week, here is another. A pink version. The base colour for this one is Layla Hologram Effect in Coral Glam, then I did the gradient with China Glaze OMG polishes BFF in the middle and QT on the tip. 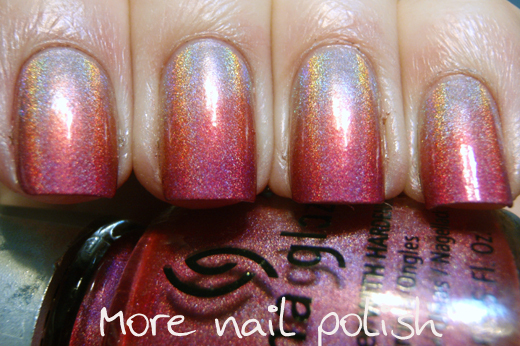 The strong holo effect from the Layla polish underneath gives these photos a very orange glow overall, which makes the final mani look slightly more coral coloured. I still love the effect though. 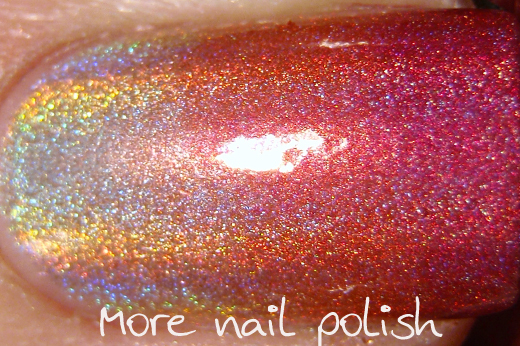 This macro really shows how much more holo the Layla polish is compared to the two China Glaze holos. And also happening today is my husbands and my 15th wedding anniversary. Yes, I really am that old, although we did get married in our early twenties. I can't believe I've been married that long and still only have a four and one year old!! Being the beginning of winter here down under, there aren't too many people that get married at this time of year. We got married on the Queens Birthday June long weekend, which is perfect now cause we always get a long weekend for our anniversary. This old photo is a little lopsided, cause it's a photo of a photo.Ahhhh look how young we were! Oh I LOVE this gradient. The colours blended so smoothly! thinking about it that was a very English saying that I haven't heard hear in Australia and I don't know the Australia equivalent. Happy Anniversary!!!!! 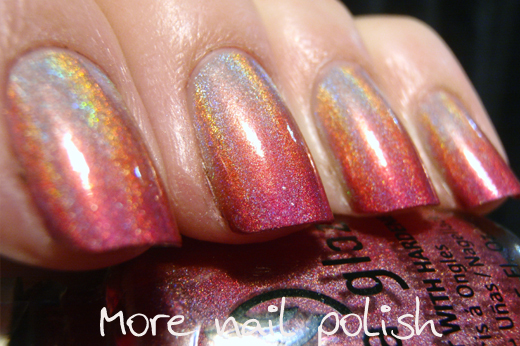 and yes yes yes I love this holo plus gradient! awww cute, congratulations!! Mani is amazing as well! Congratulations! You look gorgeous in your wedding dress! 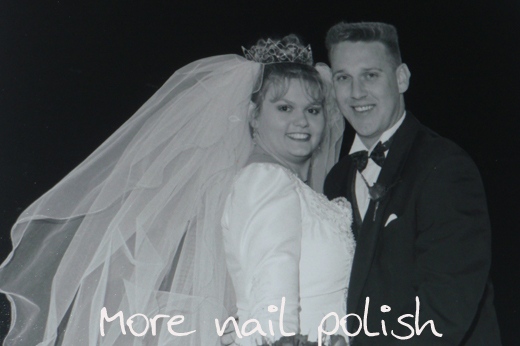 Have a fabulous anniversary and your nails are just fabulous to match! Congratulations! :) What a milestone, have a great long weekend! Lovely mani, and congratulations on your anniversary! Enjoy your weekend. That's an amazing manicure! I love it!! 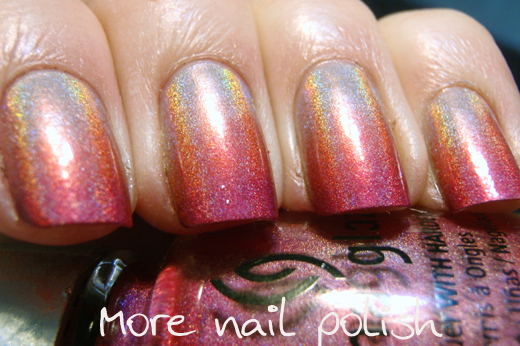 I am totally crushing on your holo gradients--you always do such a beautiful job with them! 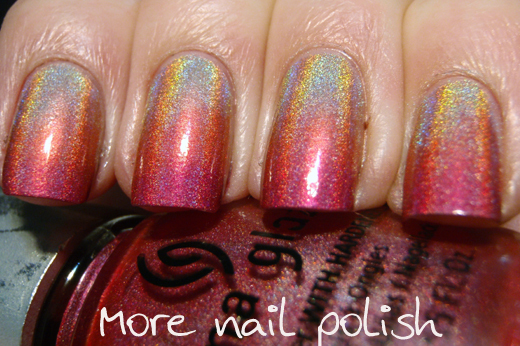 I am just loving all of these holo-gradients!! Too cute! 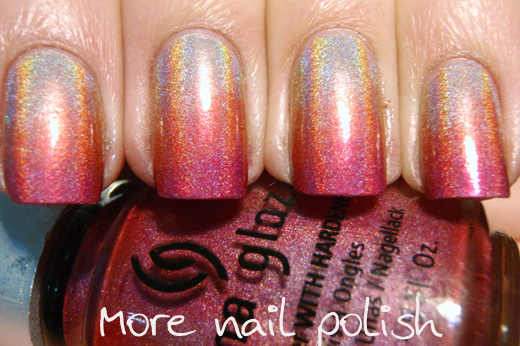 Congrats :) and gorgeous gradient. Congratulations!!! And beautiful polished nails as always! Congratulations :) I love the nails as well! Congratulations!!! Your nails look *AMAZING*!!! Time flies fast....I'm celebrating my 20th this year! Only I have a 10yo and a 17yo who is now a senior in HS! (school just ended). I feel OLD lol. Congratulations. Now while you're busy being all lovey dovey with your man, can I steal your nails please?